At a time of major overcrowding crisis in our Emergency Departments, it is simply mind boggling that there is hundreds of hospital beds closed in the health service. In Naas General Hospital there are staff shortages reducing the capacity of inpatient hospital beds. 172 beds were lost to the health system for a variety of reasons. Worryingly 33% of the bed closures were as a direct result of staff shortages. 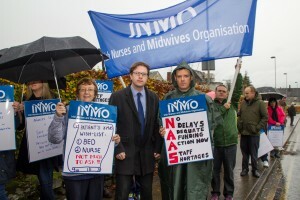 In our own hospital in Naas there are currently two beds down due to staff shortages. Despite a lot of hot hair from successive Fine Gael Health Ministers, little or no progress has been made in stemming the flow of nursing and medical graduates out of the Irish health system, and even less progress made on attracting those professionals who emigrated from Ireland. We have on average 400-500 people lying on trolleys every night of the year in our Emergency Departments across the country; yet there are nearly 200 beds out of action, and not being used to allow patients to be admitted to hospitals. Just last night in Naas General Hospital there were 17 people waiting on trollies in the Emergency Department. There are a large number of beds taken out of use regularly to allow for refurbishment and repair. I don’t understand why beds are not transferred to the many un-opened hospital wards to ensure that there is no reduction in bed capacity. 89 beds lost nationwide because of refurbishment is a scandal. There are elderly people lying on trolleys for hours on end, sometimes days, and there health and well-being is being damaged. Minister Harris must finalise and publish the Bed Capacity Review, and outline his plans to reduce the number of closed beds. For as long as there are sick people lying on trollies in our Emergency Departments, there can be no acceptance for unnecessary bed closures. It’s immoral, in my view, and it must be dealt with as a priority,” concluded Deputy Lawless.at a time of major overcrowding crisis in our Emergency Departments, it is simply mind boggling that there is hundreds of hospital beds closed in the health service. In Naas General Hospital there are staff shortages reducing the capacity of inpatient hospital beds. 172 beds were lost to the health system for a variety of reasons. Worryingly 33% of the bed closures were as a direct result of staff shortages. In our own hospital in Naas there are currently two beds down due to staff shortages. For as long as there are sick people lying on trollies in our Emergency Departments, there can be no acceptance for unnecessary bed closures. It’s immoral, in my view, and it must be dealt with as a priority.